Snacking is a hobby for me. I’m the type of person where I snack when I’m happy, sad, bored… okay, anytime is a good time to snack especially when I am sitting on couch watching one of my favourite movies or television shows. Do you have a snacking obsession too? One of my favourite things to snack on is veggies with hummus. Homemade hummus is so easy to make! In traditional hummus, the ingredients include nutty chickpeas (also known as garbanzo beans), which have a good amount of dietary fiber, protein, and vitamin B, tahini (a sesame seed paste) that makes hummus nice and creamy, zesty, bright lemon juice, pungent garlic, and fragrant olive oil. From there, you can add different ingredients to kick up the flavours such as spices like sumac, cumin, paprika, sun-dried tomatoes, caramelized onions, and pine nuts. In this recipe, I added the awesome flavours of jalapeño peppers and cilantro! I knew this recipe would go over well in my house as jalapeño and cilantro are two of Scott's favourite flavours. Now, Scott doesn't tend to snack on hummus the way I do (even though I caught him with pita chips and a bowl of this hummus on several occasions). Instead, he was inspired to make a homemade chicken shawarma using this hummus as a spread for the pita. It turned out great with the creamy spiciness of the hummus complimenting the warm spices used on the chicken. There are plenty of other sandwich/wrap options that would work with this hummus. 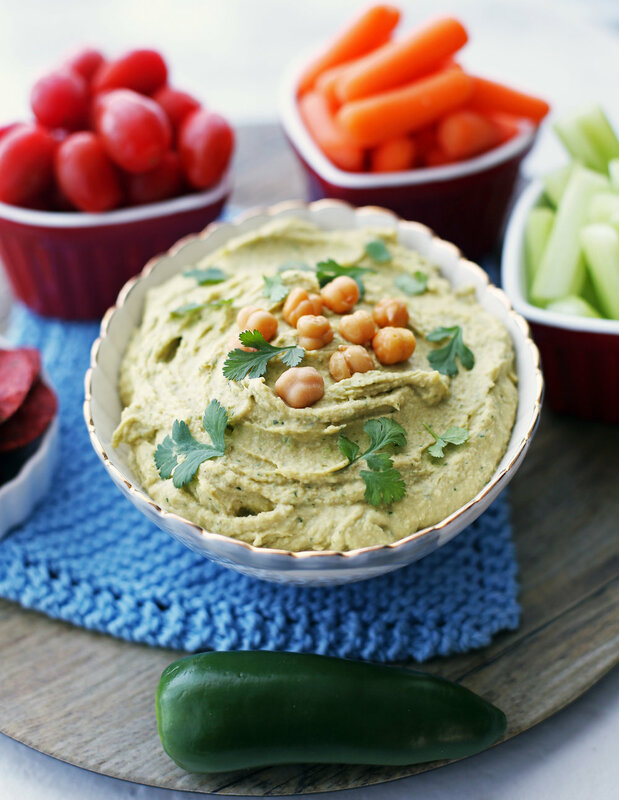 Is simple and delicious: quick and easy to make homemade smooth and creamy hummus at home. Has delicious roasted jalapeño peppers: flavourful, spicy with a little smoky flavour. Has bright, fresh cilantro flavour: it has notes of lemon, lime, and/or parsley. It compliments spicy peppers so well as it somewhat acts as a cooling note to the pepper. Is easily adaptable: add an extra jalapeños or leave in the seeds if you like it extra hot or more cilantro if you enjoy it’s flavour. Makes a great appetizer or snack for one or a crowd: serve this creamy dip with vegetables (I like carrots, celery, and grape tomatoes), pita chips, or crackers. It's a healthier alternative to potato chips and other salty and sweet snacks too. Can also be used as a salad dressing or pasta salad: Dilute hummus with olive oil and/water and toss into some leafy greens or into pasta. All the ingredients to make a yummy creamy jalapeño cilantro hummus. I ended up using two jalapeño peppers instead of one. Ingredients amounts and full instructions are listed in the recipe card below. After the jalapeños are roasted, place all of the ingredients in a food processor filled with a s-blade. Blend until nice and smooth. Taste and adjust for texture and flavour. Garnish with more fresh cilantro and a few chickpeas if you like. Enjoy! Roast jalapeño peppers. Place the oven rack on the top shelf or 3-4 inches from the broiler. Preheat the broiler at the high setting. With disposable gloves on, cut the jalapeños lengthwise, remove the stems and scrap out the seeds *(see second note). Place the halved jalapeño peppers skin side facing up on a baking sheet and place under the broiler for 3-4 minutes until the skin gets blistered and charred. Remove from the oven and place the jalapeños on a cutting board with a bowl over top of the peppers to create steam. Let it sit for at least 5 minutes before removing the charred skin. Coarsely chop the peppers. Set aside. Make the hummus. Drain and rinse the chickpeas with cold water. Optionally, remove the white skin on each chickpea (it is not necessary, but will produce a creamier hummus). Using a food processor fitted with the s-blade, place chickpeas, jalapeños, cilantro, tahini, olive oil, lemon juice, garlic, salt, and cumin in the food processor. Cover and blend until smooth, scraping down sides if necessary. Taste and adjust seasoning to taste. If hummus is too thick, add more lemon juice (it will also decrease spiciness) or more olive oil to thin and make it creamier. Garnish with additional cilantro if you like. Best served at room temperature. 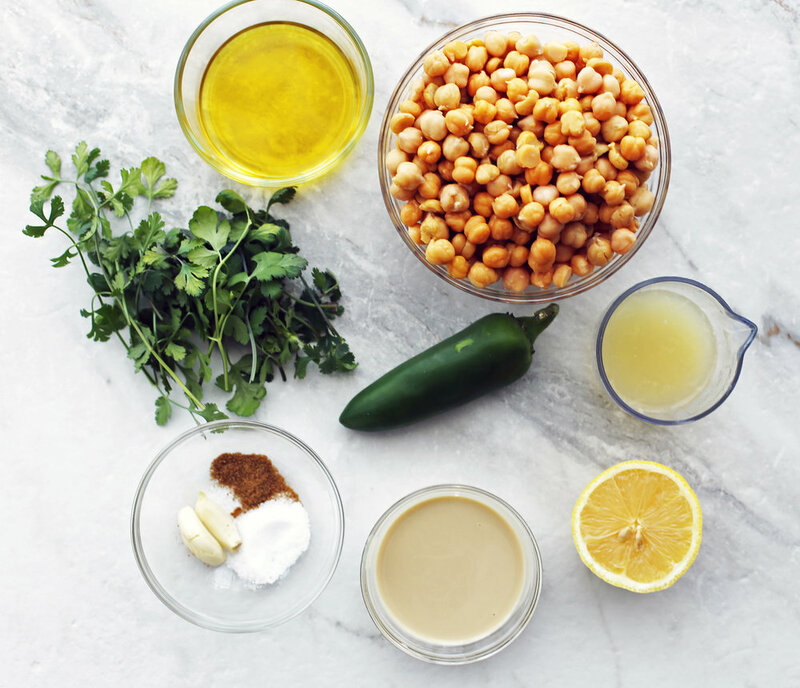 *If using canned chickpeas, note that 15 ounces does not include the liquid in the can. I bought a 28 fl oz. can of chickpeas and after draining and rinsing, the total amount of chickpeas was just over 15 ounces. **Wear food safe disposable gloves as capsaicin in the peppers can irritate the skin (cause a burning sensation). Serve with an assortment of vegetables, pita chips, and/or crackers or as a condiment for wraps and sandwiches. Nutritional calories represent 1/4 cup serving.